I was anticipating the total lunar eclipse of 21st of January a lot! January is typically a very cloudy month in Finland, and I was afraid of clouds ruining another eclipse. But luckily I was wrong, and the eclipse was visible very well from clear sky! I started observing the eclipse around 03.30 UT when the Moon was entering the umbra. From that moment I observed until the Moon exited the umbra around 07.00 UT. First I observed the eclipse at my home, but I soon relocated myself to Ulvila observatory, where I observed the rest of the eclipse. Also local radio reporter came to the observatory to do a live report about the eclipse! So this time it was a success! I’m so happy that I was able to observe this eclipse, because I have had so poor luck with many eclipses during recent years. Picture 1. Around maximum eclipse, @ 05:19 UT. Picture 2. Progres of the eclipse shown as a serie of photos. Picture 3. Combination of three photos showing roughly the outline of Earth’s shadow. Finally I was able to observe comet 46P/Wirtanen after several unsuccessfull attempts! I had been searching the comat for a couple of times before this, but then I realized, that I had been looking for in in a wrong place! I realized, that I hadn’t updated the orbital elements of the comet to my Skymap Pro, and because the orbits of comet change from perihelion to perihelion, my orbital elements were outdated. But after updating them, I was finally able to locate the comet! In the before Finnish independence day (6th of December) me and couple of other active members of Porin Karhunvartijat went to Preiviiki, a couple of kilometers west from Pori city to observe the comet and also some other objects. Weather during this observing session was windy and quite chilly! In the beginning of the session it was cloudy, but luckily the clouds went away, and we were able to observe this much anticipated comet! The comet was easy to find, and it was barely visible also with naked eye with averted vision. The comet was clearly visible in the finderscope as a fuzzy, round object. In the ocular (with 38x magnification), the comet still looked like a fuzzy, round object, with very hazy, undefined outer edge. So only the coma of the comet was visible, there wasn’t any sign of visual tail. There was a central brightening in the middle of the coma, but no other features were visible. The comet looked pretty much what I had expected and did not offer many surprises, at least no visually. In this case the comet was interesting also because it passed Earth at very close distance, only 0,08 AU! It is not very usual for a comet to come this close to Earth! Luckily it passed Earth safely, and it just provided some fun cometgazing for astronomy enthusiasts! Comet 46P/Wirtanen was found by American astronomer Carl A. Wirtanen in 17th of January 1948. 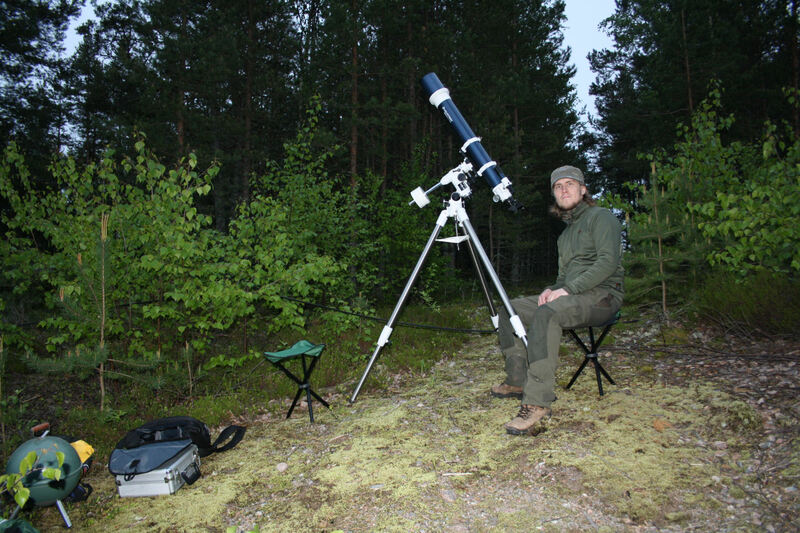 This comet is very interesting for Finnish amateur astronomers also because the founder of comet is of Finnish ancestry and the comet has Finnish name! The founder of comet, Carl A. Wirtanen discovered several comets and minor planets during his career in Lick Observatory in California, USA. Picture 1. Comet 46P/Wirtanen observed with 10” Newton in 5./6.12.2018 in Preiviiki, Pori, Finland. Some time ago I wrote about my new approach to this hobby, (black and white) film photography! As part of my film photography ambitions, I of course tried to take black and white photos of noctilucent clouds, a phenomena that I find especially interesting and fascinating! I observed a display of noctilucent clouds between 18th and 19th of July 2018 in Ulvila, Finland. This was a beautiful and bright display, and I was able to take good b&w -photos of this display. I developed the film by myself and scanned it for publishing in the blog. My scanner converts the negatives to positives automatically, but after scanning I tried to convert one of the photos back to negative to see, how NLCs are visible in negative photo. When looking the negative photo, it is easy to see, that the structure of the NLC’s becomes very well visible in the negative! So that was one of my first attempts on film photography. Besides this, I have shot more than 10 films since I started film photography in late June 2018. I will be posting about my other film photography results later! A small partial eclipse occurred in the sky of Turku, Finland on 11th of August 2018. Because I have decided to observe every possible eclipse and planetary transit observable near my location, I of course tried to observe also this small eclipse. This time weather was favourable in Turku, Finland (where it is usually always cloudy when something interesting happens in the sky), and I was able to observe the eclipse from beginning to the end. There was no sunspots in the sky during the eclipse. It was a small eclipse, but nevertheless it was fun to observe it, and I’m happy that I was able to observe it! And even better, it was second eclipse in 2018 that I was able to observe! This is very good in the climate of Finland, where it is usuallu always cloudy! @09:16 UT, maximum eclipse (8%). A series of photos showing the progress of the eclipse from the beginning to the end. A GIF -animation showing the progress of the eclipse. Finally I was lucky with observing a total lunar eclipse! I had seen my previous total lunar eclipse in 2007, but I did’t have any proper camera back then and I was just visually enjoying the eclipse. After this eclipse, I had tried several times to observe and photograph a total lunar eclipse, but without luck. So until July 2018, I hadn’t seen any total lunar eclipse in 11 years and I hadn’t been able to photograph any total lunar eclipse! But that was about to change in the night between 27th and 28th of July 2018! But even then, clouds tried to ruin my observations! My original plan was to observe the eclipse near Turku, Finland, but for some reason clouds appeared in the southern horizon, where the Moon should have been visible! After gazing the sky I made my conclusions, and I decided that I won’t let clouds ruin also this eclipse, and I started driving north from Turku, where the cloud situation was better. I drove about 100 km north from Turku to Säkylä, where I finally spotted the eclipsed Moon! I parked my car in a bus stop and started to take photos! I was in a rush because I arrived in my observing place in the last minutes of totality. But I was barely able to see totally eclipsed Moon and take some photos during last moments of totality! After a while, Moon started to exit umbra. I was able to take a series of photos showing the eclipse from 3rd contact to 4th contact, which means, from the moment, when the Moon started exiting the umbra to the moment when the Moon was touching the umbra for last time before completely exiting the umbra. I’m so happy that I was finally able to observe and photograph a total lunar eclipse! Totally eclipsed Moon @ 21.15 UT. Third contact, the Moon had just started to exit the umbra. Left side edge of the Moon had already started to exit the umbra, not the light fringe at the left side edge of the Moon. A series of photos showing the progress of the eclipse from third to fourth contact. I had been thinking for a long time that I need a new hobby or at least a new perspective to my hobby! Then during this summer I got an inspiration: I want to do film photography! I have been of course shooting film when I was young in early 00’s, but then I was using only compact camera with lots of automatic functions. So I have some idea about film photography and film as a photographic media is not totally new to me. The camera I purchased is without any automatic mode, so it is totally manually controleld! This project will give me new perspective for my hobby and makes me to learn basics of photography in totally new way for me! The camera I purchased is Canon FTb from early -70’s, and it is fully manually operated and fully mechanical. The only thing that needs some electricity is the CdS light metering circuit. Of course it is possible to use the camera without light metering, but I find it useful at least now when I am a beginner in film photography. Besides the camera, I of course bought some lenses too, I now have following lenses: 28 mm, 50 mm, 135 mm and 200 mm. Besides these I also haev teleconverter (2 x) and T2 -adapter for Canon FD mount (this camera body is with Canon FD mount, and so are of course the lenses). I’m planning to shoot mainly black and white film, but now in the beginning I have been shooting also colour negatives. I’m also planning to develop my black and white films by myself, and for this purpose I have also purchased a used developing kit and enlarger for printing the photos and also of course all necessary developing chemicals. By starting film photography, I wish to learn new skills and to become a better photographer. By shooting film with fully mechanical camera forces you to learn better the basics of taking good photos like controlling aperture, exposure time, focusing, etc. My plan is to develop and pring my all photos by myself, so there is also lots of new things to learn in developing and printing, that are almost completely new things for me! I’m planning to photograph atmospherical phenomena, night sky, eclipses, deep sky, and all such objects and phenomena that I find interesting! Exactly 10 years ago, on 29th of June 2008 I started my first incarnation of this blog! So it’s already 10th birthday of Celestial Sphere! It’s amazing, I can’t believe, I’m still active and running this blog, wow! Since the beginning of this blog, many things have changed. In the beginning I wrote in Finnish on Blogspot, but then I moved my blog to WordPress and started blogging in english. Also the appearance and style of this blog has changed many times over the years. But what remains, is my passion for amateur astronomy, atmospherical phenomena and blogging! Many thanks for all of you who have stayed with me during these years! I’m sure, there will be many more ahead!